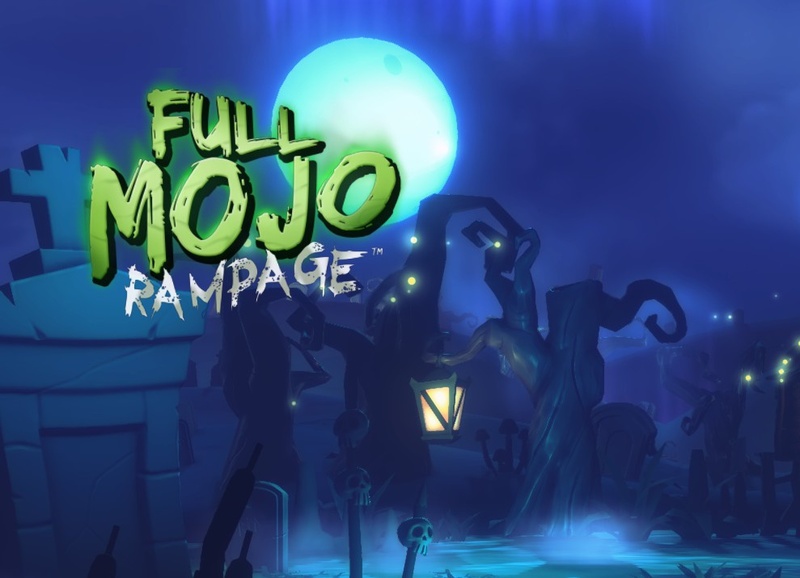 Full Mojo Rampage is in ALPHA stages as of this preview and is the second in our recent roguelike roll call. 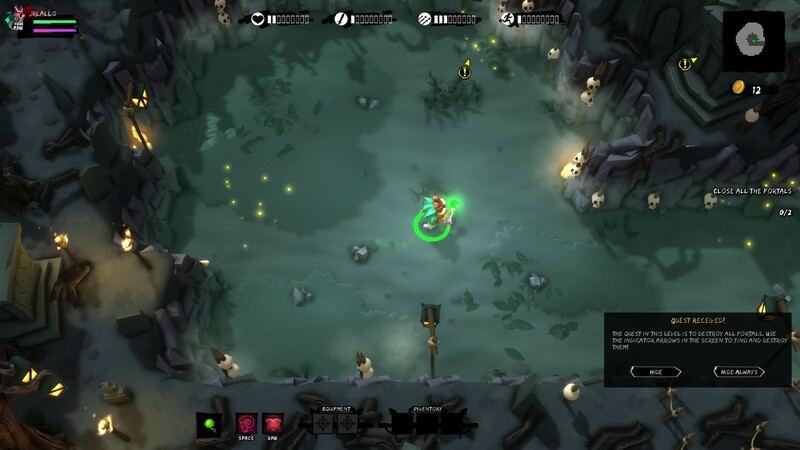 Unlike the traditional roguelike path followed by Sword of the Stars: The Pit, FMR is more of the Binding of Issac school of thought, mixing more action into the gamplay. How well did it do? Read on. FMR has some imaginative visuals which manage to span a wide range of environments while still adhering to a basic theme. Since that theme is voodoo, the enemies, characters, and environments are all spooky or otherwise supernatural, and lean heavily toward the bayou and similar settings. In a rarity for a roguelike, graphics are full 3D, though it is still played from roughly the top down, giving it the same effective level layouts as a standard roguelike. The levels are procedurally generated, but for the most part they feel natural, with no glaring seams or discontinuities. One thing that stuck out to me was the usage of dynamic shadows, which can have some really neat visual effects when things like spikes and fireballs show up together. 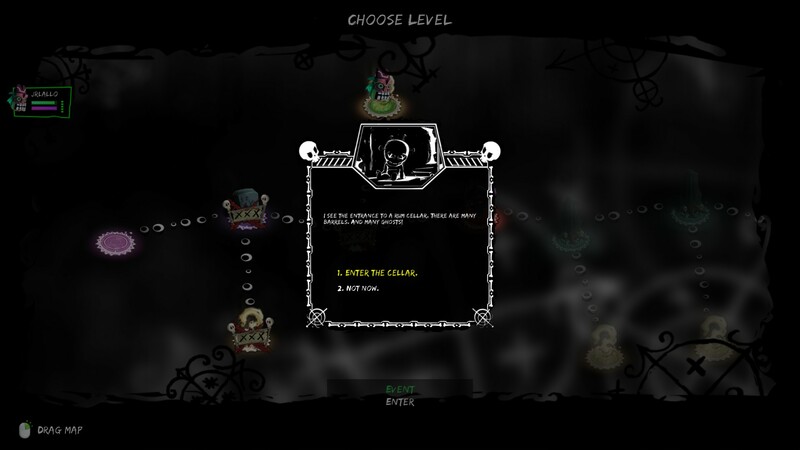 You play as a voodoo-doll-eque little guy with a selectable mask, and most of the enemies are of the standard creepy/swampy ilk. You’ll see plenty of skeletons and imps. Slime monsters and bizarre sword-wielding fish make a strong showing. The usual massive menagerie of exotic beasts one might find in such a game had to be trimmed down some thanks to the polygonal visuals, so some palette swaps and alternate scales are thrown in to help beef up the variety. 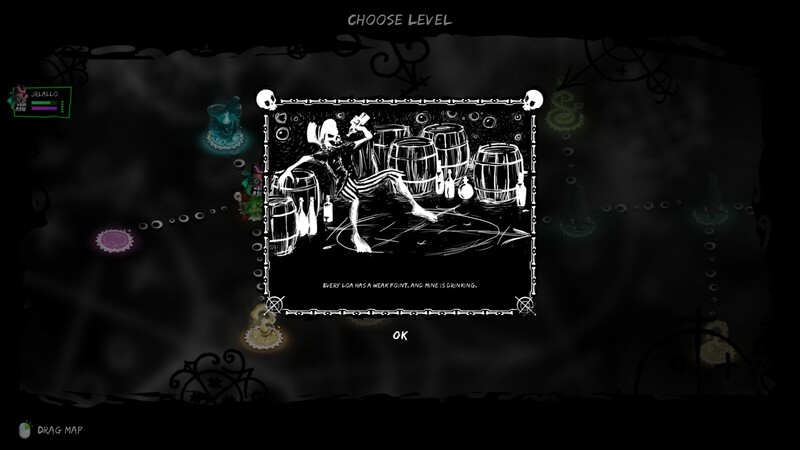 Levels are introduced with some story cards with a fun style, and the selection of masks is enough to give you a good idea of what the full game will have in store. It doesn’t scream next-gen, but the graphics are fun and functional, which is all I you really need. 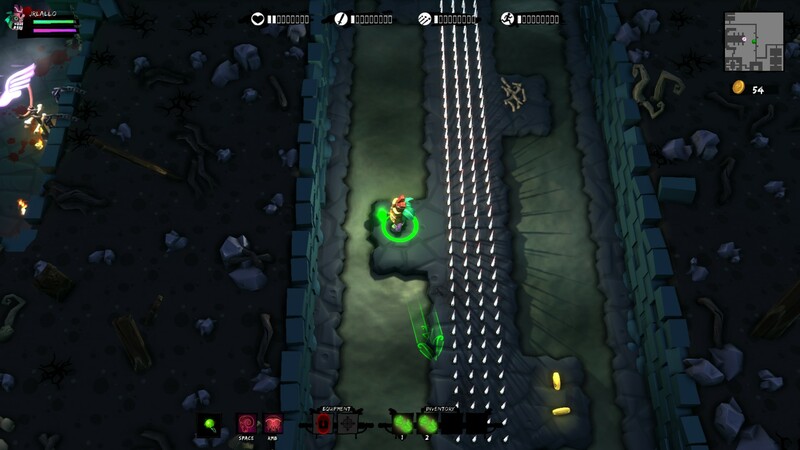 At its core, this is a roguelike executed via twin-stick shooter mechanics. You control a voodoo doll with an assortment of wands available to you which provide most of the standard gun options: big slow projectile, small fast projectile, penetrating projectile, bouncing projectile, beam, etc. Besides your standard pea shooter, guns have a limited amount of energy, but some powerups allow you to recharge it. In addition to typical weapons, time and combat will allow you to build up “mojo”, which is this game’s magic system. 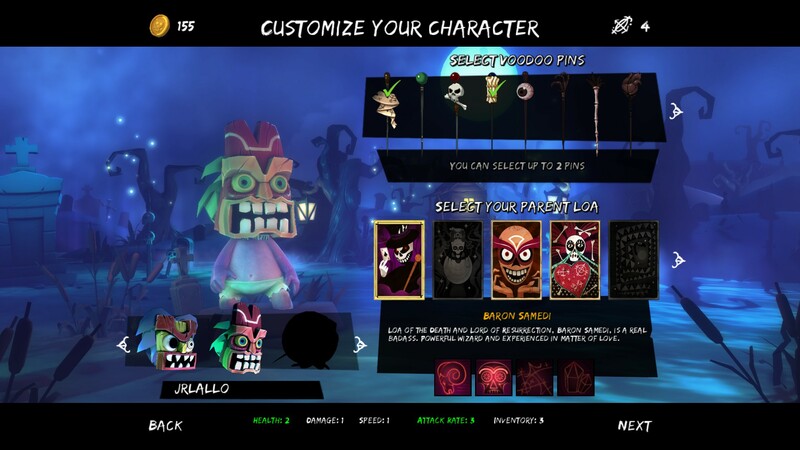 At the start of each game you’re asked to choose a parent loa, which decides your mojo-fueled abilities, and a few voodoo pins to alter your starting stats. Along with the standard ones like health, damage, speed, and attack rate, another configurable value is inventory, which is an interesting addition. Having additional inventory is useful for two reasons. One is the ability to hold more relics, which are used in the game to improve and modify your character. As you can imagine, the more the better, so picking up extra inventory slots of this type is a rare and useful treat. More standard inventory slots let you hold potions, unused wands, and unequipped relics. That gives you the ability to reconfigure, heal up, and rearm on the go, much like the more standard equipment finagling that one might do in a typical roguelike. Gotta love that pretty face. 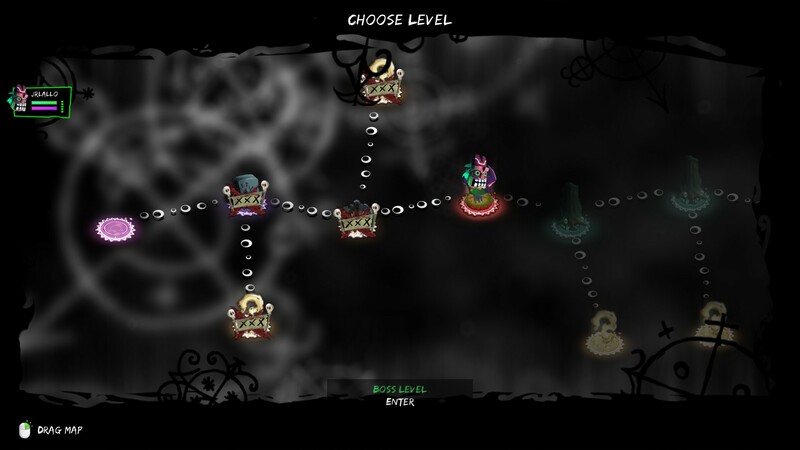 Levels are randomly generated, and have a few different potential goals. You usually have to reach an exit, with enemies randomly popping up around you and chests and secrets showing up scattered around the map. Some levels will require you to close “portals” which are totems that are protected by a beefy miniboss. Other levels give you a time limit and a pile of specific enemies to kill. 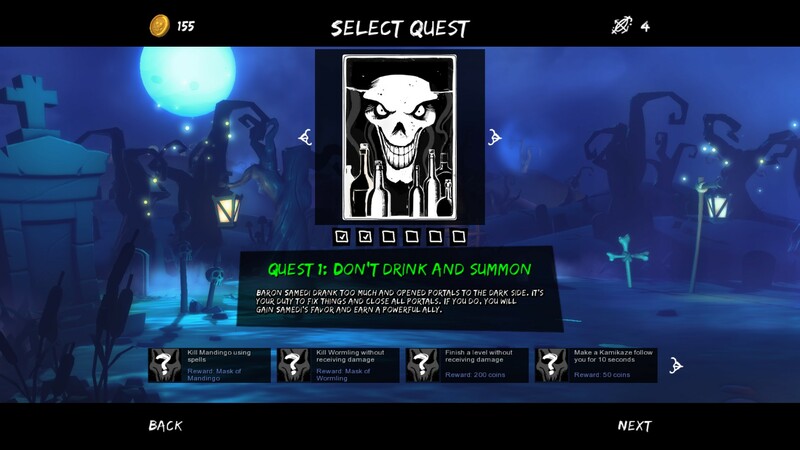 After each level you are sent to a map to choose your path, which could be a standard level, a boss level, a bonus level, or an encounter which will reward or punish you based on your selection. There are some aspects of a standard roguelike which are missing from the game. There’s no real crafting, and you don’t have to worry about weapon-wear, disease, or hunger. But the important things—like random level design and permadeath—are all intact. The cherry on the top is the reward system and unlock system. 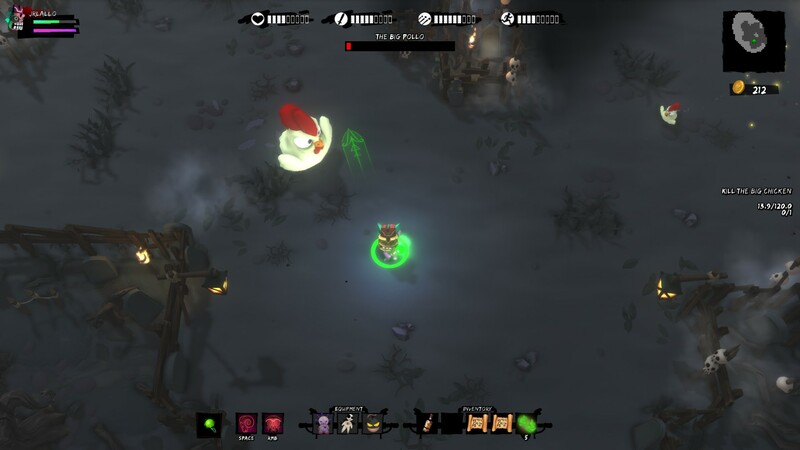 You are able to buy things like new “pins” for your starting build by accumulating coins during the gameplay, and the challenges they give you, such as defeating bosses only with spells, or without losing any health. 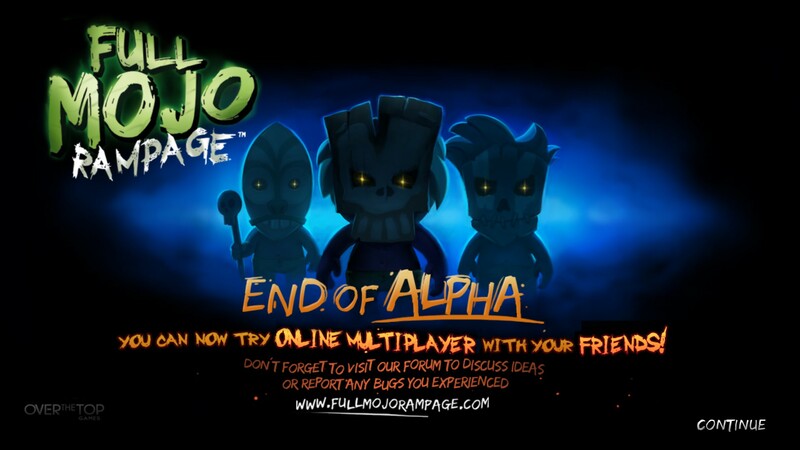 Oh, and perhaps most importantly of all, you can play multiplayer! Run that through your mental simulator and tell me it doesn’t get your juices flowing. The music is a match for the creepy atmosphere, with a main theme that you could imagine being played on a cartoon skeleton’s rib cage. Skeletons with jaunty top hats are always the most dangerous. The story is somewhat minimal. 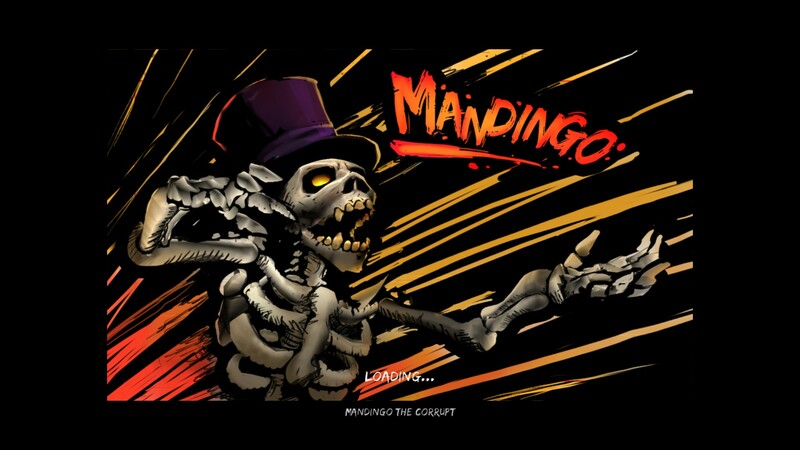 You are doing a favor for Baron Samedi, a hard-drinking voodoo-deity who could use a bit of help cleaning up a mess. Each level gets a single panel slice of comic explaining a bit more of the situation and indicating what’s in it for you if you succeed.